One of the simplest ways to earn extra money is data entry job. You can work on online data entry jobs and easily earn Rs 30000 to Rs.50000 per month. Your income from online data entry jobs depends on the type of work, your typing speed and time spent by you. If you want to earn extra income online here is 20 Online Data Entry Jobs for you. You can start this job from home without any investment. Go through each & every data entry jobs to find out which is best suitable for you. Captcha entry job is one of the simplest data entry jobs. Captcha is a security mechanism that is used to identify that who is interacting with web page human or robot. Captcha is an image with random alphanumeric text which the only human can read and solve. Captcha solving is a must when you open email account, net banking account, sign up for a website. It is used to protect a customer from hacking and other malicious activities. There are many organizations which need manpower to generate different types of Captcha text to improve protection mechanism. On the other hand, many companies hire a person to solve captcha for registration of e-mail or other accounts. How much can you earn from Captcha Entry Job? Your income from captcha solving job completely depends upon you. You can earn money from Rs 10000 to Rs.30000 based on your typing speed and captcha solving speed. You can get captcha solving work from sites like 2Captcha, megatypers, protypers and clixsense. Copy Paste data entry jobs are jobs where you will be paid for doing a simple copy and paste job. The data could be text or image. Your job is to copy it from client and paste it on the server. The text matter may be 1 word, 1 line, 10 line or several pages. You have to complete the job in fix time otherwise company might terminate your account. Copy Paste job is required when a company wants to generate a similar type of content. It is also required while company wants to make single content from multiple readymade sources. The copy paste work is also used in Ad posting work for a classified website. You can make daily Rs.500 from copy paste jobs. Your income depends upon your speed and knowledge. 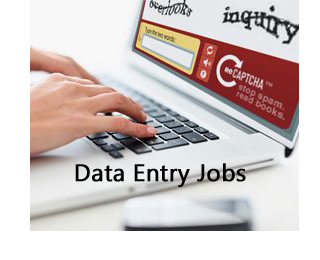 There are numbers of websites where you can find micro jobs related to data entry. Micro Jobs are a small job that can be completed in few hours. Online micro Jobs is one of the most recommended methods for earning extra money using data entry. Some examples of Micro job task are like typing letter, e-mail, making documents etc. One of the basic data entry jobs is typing. In the typing jobs, you need to type specified text from hard copy to an excel spreadsheet or a word document. You only need a typing speed of 30+ words per minute. In order to increase your typing speed, you can start practicing on the keyboard. The next online data entry job is filling up a survey form. In survey form job you need to fill up survey form on the website. This form contains questions about products which help companies to improve a product. You need to give honest feedback. You can earn up to $500 by doing survey form filing job. The next data entry job is converting an image to text. You will be given image file containing text. You need to read the text and type it in a word document. You can easily earn $300 by doing this type of jobs. The medical transcription is most popular data entry job now a day. In this job, you need to convert voice recorded report into text format. You need to be extremely good at listening skill. Knowledge of medical terminology will be added advantage. The next job is formatting in this job you have to format the word documents. It could be related to indentation, aligning text etc. You should have knowledge of MS word document. The next most promising job online is content generation or content writing. In this job, you have to write a meaningful article. The article length varies from client to client. This job demands a lot of dedication and time. Catalog data entry job is for creating an inventory list in excel. This inventory list includes the product name, description, associated serial number, and price. The payout, in this case, depends on a number of catalogs made by you. Proofreading and copywriting is the job of reading content and making sure that there is no mistake in the content. You should be extremely good at reading and identifying mistake. The next associated job is copyrighting where you need to identify that content is original and not copyrighted. In the job of e-mail writing, you need to write an e-mail and send it to a specific address. You might be asked to write a number of emails in a day. It is an exciting job. The next data entry job is prototype typing where you need to convert content from physical write-up to electronic format. The amount of money that can be earned from this job depends on the size of content converted by you. The next idea of online data entry is e-book conversion. In this idea, you need to convert an entire physical book in e-format. You can type the content or use OCR based scanning for the same. In audio to text conversion job, you will be given pre-recorded audio tape. You need to convert this audio into text. You will be given money based on per clip conversion. A Captioning job is writing a text of what was said in the video and time codes for when captions should display. Once you make text file you need to email the file. You will be paid based on length of a video. A reformatting and correction is a job of rearranging text and correcting mistakes already highlighted. It is one of the easiest data entry jobs. The next data entry job is business card data entry. In this job, you will be given multiple business cards. You need to make entry of specific data from each business card like phone number, designation, name etc. In yellow page data entry job you need to enter a relevant data from source to yellow pages. You will be paid based on the creation of every yellow page. The last data entry job is application code data entry. It is advisable to get knowledge about programming as it demands skill of formatting code. So these are some of the data entry jobs available online on the Internet. You need to find out more about these jobs and prepare yourself to become a data entry operator. Hello sir. Information is very good and very useful to unemployees like me. Kindly let me know about the website details, so that only we can approach. hi i am gargi.i am intrested in data entry jobs but don’t want to join any fake site can you plz tell me about some legitmate site.